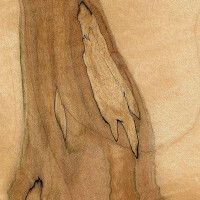 Much like Ambrosia Maple and other forms of figured maple, Spalted Maple is technically not a specific species of Maple, but rather a general description of any type of Maple that has been allowed to begin initial stages of decay, and then subsequently dried (preventing further decay). 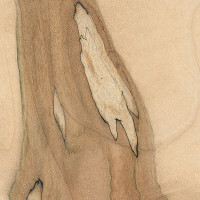 The partial decay, called spalting, gives the wood dark contrasting lines and streaks where fungus has begun to attack the wood. If the wood has been rescued from the spalting at the right time, the lumber should still be sound and usable, with little to no soft spots or rotten wood. Can you recommend a few brands of epoxy and tell where you purchased it? I found a spalted maple stump at a local recycling place, had it cut and have made it into a table top. I treated it with wood juice and am letting it dry over the winter. I’d appreciate any suggestions ! I have 6/4 spayed maple with 1/64 diameter pin worm holes in face of boards. Are they still worth anything. Absolutely still worth something. Worm holes aren’t a problem. Just fill them with tabletop epoxy, or something else, and build as normal. They can even be a decorative accent. I recently finished a project using some of my spalted maple and there are regular worm/beetle holes that are 1/8″ or more in diameter. I was lucky enough to have a spalted maple come down in a wind storm in my back yard a few years ago. Since then, I’ve been able to pull a Ukulele (back/sides/top/neck) and Mandolin (back/sides/neck) from the logs we salvaged. I tried uploading a few pictures, but it seems my login only lets me post text. That’s interesting. There’s some acoustic guitars that use spalted Maple for back and sides. The challenge I find is that the longer thewood is allowed to rot before harvesting, the more interesting and beautiful it becomes. Often the best looking pieces have decayed so far as to need a stabilizer before working. What would you use/recommend as a stabilizer? What I found to work as a stabilizer as good as any other is ordinary wood glue mixed half with water. brush it on the rotten wood, let soak and leave overnight to dry. Linseed oil will not work as a stabilizer — it doesn’t dry solid enough for that sort of purpose. I recently completed four of a set of 8 meditation stools for a custom project and the spalted maple I had was a bit on the soft side in a few places. I used table top epoxy as both stabilizer/void filler, and as the final finish — the good epoxies (as opposed to 5 minute epoxies) get quite runny when they are freshly mixed, so they flow deep into the soft/rotted wood. Judging by the depth of soak when looking at and probing the end grain after final trimming, the epoxy penetrated all the way down into the softened spots — 1/2″ or more of depth in some places. The epoxy cures very hard, so it makes an excellent stabilizer, and it won’t cause splotches of discoloration the way wood glue will, especially if using it as the final finish as well as the stabilizer. Boiled linseed oil will not make a good stabilizer. It doesn’t dry solid enough. While the wood glue and water will work, it also will potentially cause spots of discoloration when a finish is applied. I recently finished four little meditation stools using pretty heavily spalted maple that had some soft spots of rot. I used table top epoxy to harden those areas and to fill voids left by insects. After soaking the rotted wood, I trimmed the pieces to their final width and was able to check the depth of penetration of the epoxy along the endgrain. The epoxy appeared to penetrate all the way through the soft spots, reaching a depth of 1/2″ or more in some places. It worked great. It is a time-consuming process, and table top epoxies are fairly expensive, but the outcome is well worth the expense, IMO.